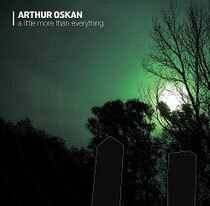 Arthur Oskan’s debut album ‘A Little More Than Everything’ has been nominated for a Juno Award in the Best Electronic Album category. Released on Thoughtless Music, The Juno Awards are essentially Canada's answer to the Grammys: the highest official industry recognition a Canadian artist could receive. The Best Electronic Album category was created just last year, when it was won by Caribou for ‘Swim’. Arthur Oskan is nominated for this year's award along with Austra, Azari & III, Junior Boys and Tim Hecker. A fixture of Toronto's underground techno scene, Oskan's deep and lush yet essential techno sound is treasured by many. Performing live with analog gear for over a decade, his thrilling sets effortlessly fuse sleek machine grooves with evocative synthetic melodies. Following numerous EPs and 12” singles for a slew of international labels, Arthur's debut full-length is a distinctive distillation of his uniquely refined take on soulful analog techno and minimalist tech-house.